This is one of the days when you are watching YouTube and you see in the Related Videos on the right side one you curiously clicked. Usually you end up watching a chain of videos and you end up watching something very strange, but this time it was good. 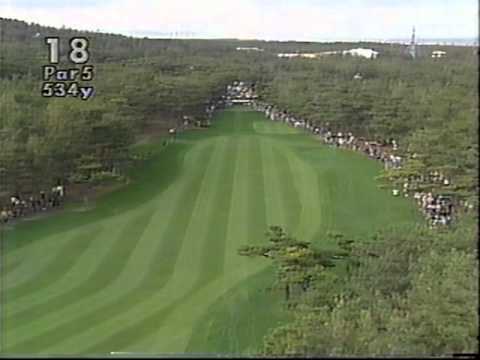 I actually remember watching this broadcast here in America in 1993, soon after I started playing golf. 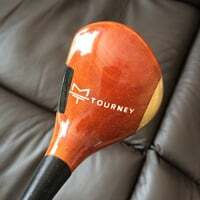 It was my second time seeing this Ernie Els fellow (the first time was in the 1992 Open Championship at Muirfield when David Leadbetter was on the mic talking about his new prodigy Ernie), and here in this tournament he was using a persimmon driver. I am posting the video here because the title is in Japanese and I may lose it forever, so while I am watching it now, I want to share it with you. Curiously, I remember that when I first saw this on ESPN, I tuned in at this exact moment when Ernie was teeing it up on the final hole. The first thing I thought when I saw this guy's swing and thought how beautiful his swing is. It is good to see Ernie swinging a persimmon wood, though Jumbo passed him by twenty or so yards. Although it is not shown in this clip, I do remember the post-round interview during the awards presentation. Ernie just won and the interviewer had asked Ernie before the crowd, with a Japanese accent, "So Ernie, tell me how it feels to win 26 million yen?" Ernie was baffled and asked in response, "How much is that in dollars?" By any chance does anyone know what the exchange rate was back then, and how much 26 million yen was worth back then? Bet he did. He was crushing it by Phil and Ernie. The exchange rate was about £1 = US$1.5, so that is a little over US$1 million. The Yen to Dollar rate was about 120 yen = US$1. So, that would have about 120 million yen. 26 million yen in 1992 or 2002 would have been about US$216,000. So it's the 1993 Dunlop Phoenix tournament, which is played down in Miyazaki in Southeast Kyushu. Ernie Els went on to win it. It's a big tournament on the Japan Tour, and gets a pretty decent turnout of overseas players. Previous winners include Johnny Miller, Tom Watson, Graham Marsh, and Luke Donald. Brooks Koepka has won for the last two years. It's actually not that far away from me, and I keep meaning to go and watch one year, or even better, go and play the course (obviously not in the tournament). Awesome video. I remember the Ozaki brothers at Turnberry 94. They had loads of hangers on, journalists and about 20 photographers. 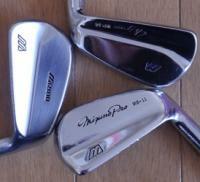 Jumbo had a set of Bridgestone forged cavities with graphite shafts. He nailed the longer shots but his short game was a bit hit and miss. They were always polite and happy to sign autographs. Great video. I remember getting Ernie Els autograph the week before he won at oakmont. Seems like ages ago now. His swing looks identical. Phil’s backswing, on the other hand, looks pretty funky, no? At work so can't watch the vid but was Els' swing as smooth then as it was when he was in his hay-day? If so I could see most anyone driving it past him as it always looked to me that he was swinging about 70%.